Apparently, a literary trend has been influencing new parents. Closeup photo of five month old baby boy (Asian/Filipino) on his tummy staring at the camera. He has a heart shaped mouth. Nameberry released its top baby names of 2015, revealing some unique and unlikely picks. Thanks to a new literary trend, Esme and Kai have been named the hottest monikers of the year, according to the site. Some might recognize the name from J. D. Salinger’s short story, “For Esme – With Love and Squalor.” However, the moniker likely gained fame in recent years thanks to the character Esme Cullen in the ever popular “Twilight” series. As for Kai, the name not only has literary ties, but also a multi-ethnic appeal, Satran explains. “It means sea in Hawaiian and also exists as a name in Japanese, Maori, and Navajo, and also has a connection to children’s literature as the name of the little boy who is enchanted in ‘The Snow Queen,’” she said. 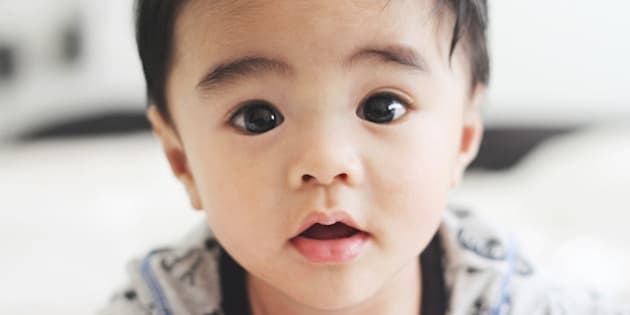 To determine the hottest baby names of 2015, Nameberry looked at which monikers rose the furthest from 2014 to this year. Both Esme and Kai rose over 55 spots. Flip through the slideshow below to see the top 10 girl and boy names that rose the furthest in 2015. In 2015, the top 10 girl and boy names were relatively the same as last year. However, thanks to the birth of Princess Charlotte, that moniker reached number one on the list. Amelia came in second, followed by Ava, Olivia and Cora. Earlier this year, it was revealed that the literary name Atticus, from Harper Lee's "To Kill A Mockingbird," topped Nameberry's most popular list for the first half of 2015. While Atticus still managed to make the top 10 list for boys overall, the moniker fell from first place. Ezra is now the top baby boy name of 2015, followed by Asher, Atticus, Declan and Oliver.